In 1947 the Mexican government dammed rivers to form Lake Miguel Aleman in the small village of Valle de Bravo in Mexico state. 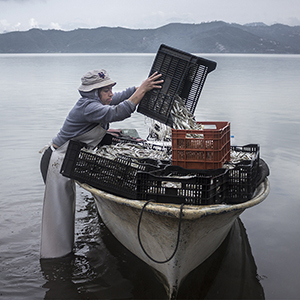 As the water spread and swelled through the fertile valley, it submerged settlements, farmland and a way of life that local families had cultivated through generations. These stories trace the legacy of that transformation. The lake brought new wealth from tourism and new leisure and business opportunities emerged. 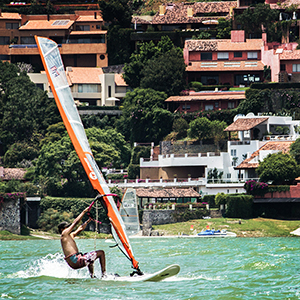 The Martinez family pulled themselves from poverty by catering to windsurfers who come from Mexico City and other wealth centers on the weekends. 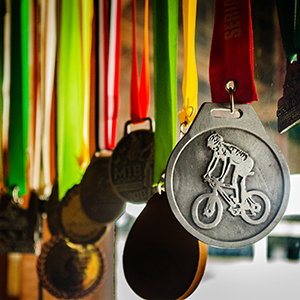 The Pineda family rides a surge in popularity for bicycle racing to define their own dreams. And a pied-piper band director has the back alleys vibrating with practice scales each evening. The lake also engendered a new fishing industry which enabled a path to the middle class for those lucky enough to get a license, many of them women. In 2005, Valle de Bravo was officially designated a “Magic Town,” though not everyone feels the magic. The Ponce family, including four elderly unmarried siblings who all live together, was among those who lost their farming way of life when the waters rose. Displaced from the valley for most of their lives, they never fully recovered. This is not a project about a lake. Herein are the tales of ordinary people who live on the shores of a persistent reminder that nothing stays the same forever and we must forever be open to change. An aging midwife anxiously tends to her patients. She knows no one trained in her traditional practice is coming to take her place. A fortuneteller helps her clients navigate their futures through tarot readings. And a widower heals his wounded heart on the wind. 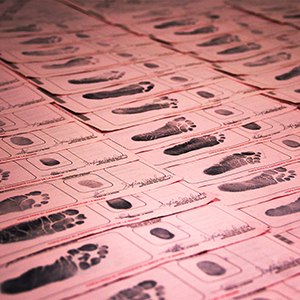 These are stories from the Heart of Mexico. The Heart of Mexico program was founded by Thorne Anderson and Lenin Martell. 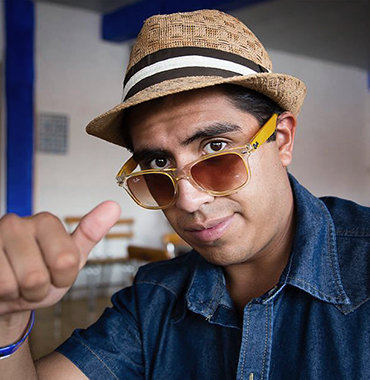 The project, now entering its third year, brings together students and faculty from the University of North Texas (UNT) and the Autonomous University of the State of Mexico (UAEM) for one summer month in a small town in Mexico state. The Dallas Morning News supports the program with members of their editorial staff who serve on the faculty. teams, each comprising at least three of these specialties: writer, videographer, still photographer, and translator. Academics from the UAEM Department of Tourism presented their research to the Heart of Mexico group to provide a foundation for students’ field work. presented their stories in a public forum open to a local audience, even including the subjects of the stories. The Heart of Mexico project performs as a beacon for cross-cultural, cross-disciplinary collaboration and narrative multimedia storytelling. Each year the project expands its capacity as a field school where journalists and academic researchers might come together for mutual benefit – to intensify the depth and quality of storytelling, to provide an outlet for academic researchers seeking a wider popular audience, and to explore the boundaries and potential for narrative evidence. Greta studies Communication at the Autonomous University of the State of Mexico, she also travels every weekend to Mexico City to study Photography. She is interested in cultural and gender studies. Even though photography is her passion, she would like to start producing video. She collects subway tickets from different cities of the world. She was a photographer and interpreter for the project. She says that The Heart of Mexico showed her corners of her own country that she didn’t know about. The project made her feel even prouder of being Mexican. James Coreas is an undergraduate interdisciplinary studies major at the University of North Texas. 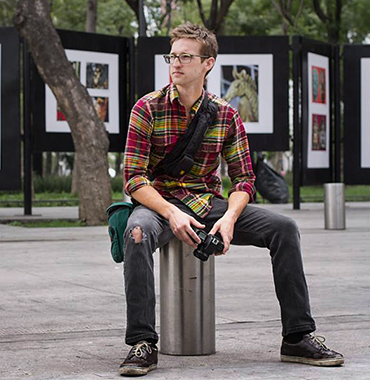 He is a founding member and photo editor for Hatch Visuals, a student-run visual media agency. Anaid studies Communication at the Autonomous University of the State of Mexico. 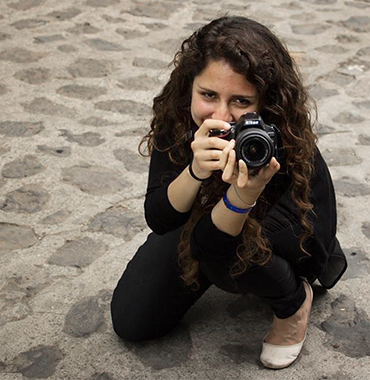 She recently started to study photography and took a film-documentary class, which made her become interested in documenting the different narratives in Mexican society. In March 2014, she participated as a photographer, with some of her classmates, in the photographic exposition called “Rostros de las Mujeres Mexiquenses”, produced by the Woman Institute of the State of Mexico. She collaborates as a photographer in The Heart of Mexico project. Alice Nalepka is an undergraduate student at the University of North Texas. She will graduate with a Bachelor’s of Arts in Journalism in December 2014. Alice began her own freelance business, Photos with Alice, in 2012. She served as a multimedia producer for Heart of Mexico 2014. Alice plans to pursue visual storytelling for non-profit organizations and other businesses after graduation. 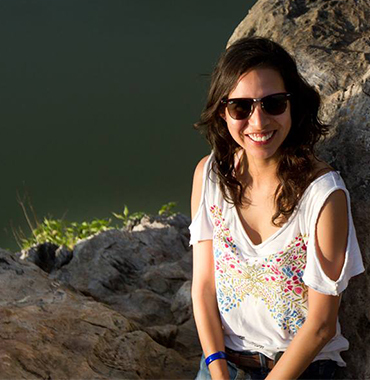 Karen studies Communication at the Autonomous University of the State of Mexico. Her passion for the music and dance led her to document on photography music concerts and dance performances. She produces and anchors the youth and students’ podcast with the Youth Municipal Institute in Toluca. Karen was chosen this past April to become the “Zona Joven” official voice—an internet radio program produced by the Toluca government. She was also a national finalist in the 4th university contest “Seamos Nosotros” (Qualitas Awards). Prior to this, she was a radio announcer in 2013 at Ultra Radio in Toluca for the “Acceso Total” program. She has collaborated with the School of Chemistry doing photography of products. In the Heart of Mexico she participated as a photojournalist. She intents to portray in her lens the everyday beauty that surrounds us every day. Desiree Cousineau recently graduated with her M.A. in journalism from the University of North Texas. Desiree focuses on visual journalism and multimedia. During graduate school she was a founding member and photo editor for Hatch Visuals, a student-run visual media agency. She worked on several multimedia projects including one with two fellow graduate students on the subject of immigration titled The Arrivals. 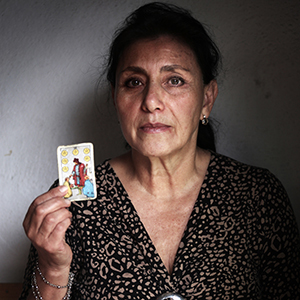 Her multimedia story for Heart of Mexico 2013, “Just Go: Three Generations of Women Breaking Barriers,” won second place in the National Press Photographer Association in the professional multimedia category in November 2013. 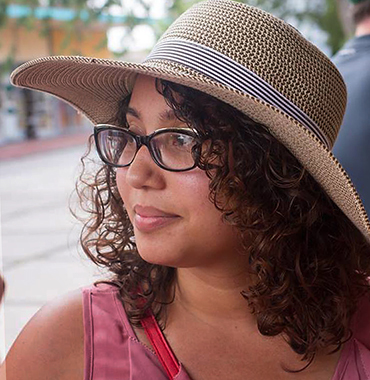 Desiree worked as Writer in Residence for Heart of Mexico 2014 based on her previous experience with both written and visual communication. Finished with school, Desiree hopes her next step will lead her to documentary photography and video production, preferably somewhere in the mountains. Byron Thompson is an undergraduate student at the University of North Texas studying news writing and photojournalism. 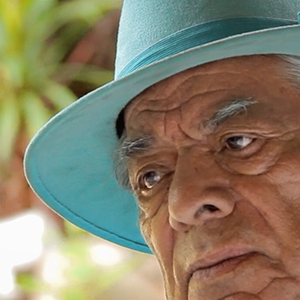 With a piqued curiosity for narrative news, Byron served as a writer for Heart of Mexico 2014. He currently works as senior staff photographer at the award-winning student newspaper, the North Texas Daily and as communications coordinator for Hatch Visuals, the student-run media agency in the UNT Mayborn School of Journalism. Ashlea Sigman is a graduate student studying narrative writing and documentary filmmaking at the University of North Texas. Her short documentary, “When the War Came to Texas” will screen in October 2014. In June, her account of the legal fight between Dow Chemical and farmers along the Brazos River ran on the front page of the Dallas Morning News. Previously, Sigman managed media relations for a healthcare system and reported for the NBC affiliate in Wichita Falls, Texas, and the CBS affiliate in College Station, Texas. Her investigative, spot and general assignment reporting has been honored by Texas AP Broadcasters. Karina majors in Communication at the Autonomous University of the State of Mexico. She has focused her studies on strategic communication. 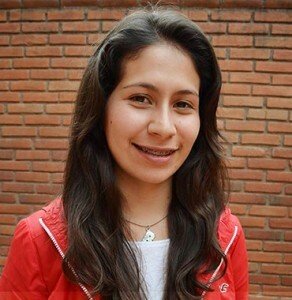 She also works at the Culture Digital Center at UAEM where she participates in projects for high school students. Right now she produces the “Arbol de la vida”—a documentary about Metepec’s traditional crafts. She is also a short-cut film director, which discusses the corn as a national-identity symbol. Cultural studies in Mexico is her passion. In Heart of Mexico she worked as a writer. Jaqueline is passionate about radio and cinema. She is a radio reporter for the UAEM station, Uni Radio 99.7 FM. She majored in Communication at the same institution. During her professional life, she has worked at various media companies and social communication offices at the State government, such as the Financial Secretary and the Electoral Institute. Jacqueline is a soccer fan, her favorite team is “Toluca”. She is a perfectionist, an idealist, and a happy person. Promoter of dignified treatment for animals living on the street. In the future she wants to establish an association for stray dogs. She claims The Heart of Mexico project has been a professional experience — but mostly personal — that has changed her life. Hatch Visuals, a student-run visual media agency. She worked on several multimedia projects including one with two fellow graduate students on the subject of immigration titled The Arrivals. 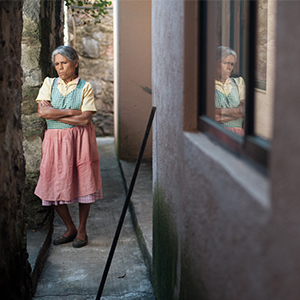 Her multimedia story for Heart of Mexico 2013, “Just Go: Three Generations of Women Breaking Barriers,” won second place in the National Press Photographer Association in the professional multimedia category in November 2013. Desiree worked as Writer in Residence for Heart of Mexico 2014 based on her previous experience with both written and visual communication. Finished with school, Desiree hopes her next step will lead her to documentary photography and video production, preferably somewhere in the mountains. 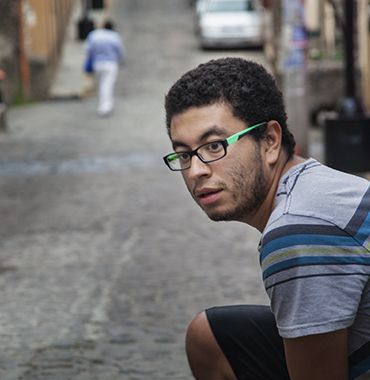 Drew Gaines completed his undergraduate coursework with the Heart of Mexico 2014 program. 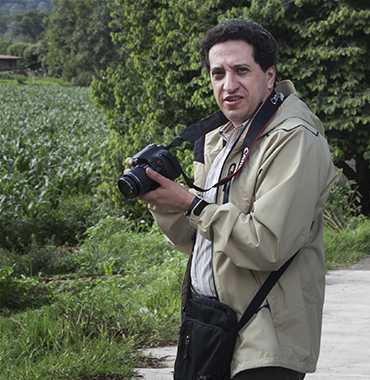 His time in Valle de Bravo was spent both writing stories and producing a multimedia piece for the project. As a student at the University of North Texas, Drew filled various positions at the North Texas Daily, the award-winning student newspaper. He documents everything from music festivals, urban farming and homelessness in his hometown of Denton, Texas and hopes to one day take his skills abroad to shed light on social issues. Ignacio recently graduated from the School of Languages at the Autonomous University of the State of Mexico; his passion is music and learning something new every day. 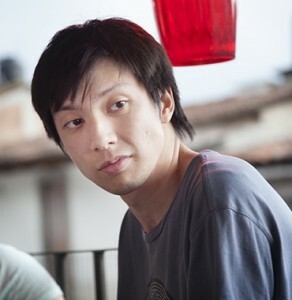 He studied dubbing and voice acting; he believes that the voice can change the world. He has collaborated in some humanistic and social projects. He has taught some workshops related to dubbing and reading. He aims at becoming a sports anchor and work on education projects. He considers that you can help yourself by helping others. He worked in the Heart of Mexico as a translator; he thinks this experience has changed his life in both the professional and personal level. 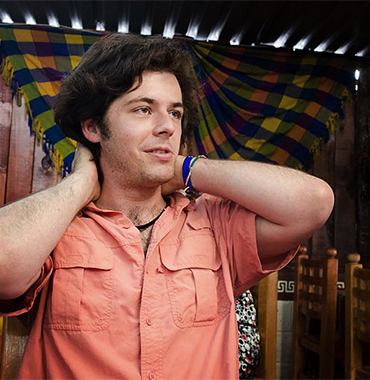 Alland studied in the School of Languages at the Autonomous University of the State of Mexico. The emphasis of his degree is translation. In the project The Heart of Mexico plays the role of translator and interpreter. He currently researches about the dubbing of the taboo language in English to Mexican Spanish because this is his main topic in his dissertation. Nowadays he is also taking a photography course at the School of Languages. Veronica has just graduated as a Bachelor of Arts in Languages in the Autonomous University of the State of Mexico. She is passionate about Linguistics and wants to become a researcher. 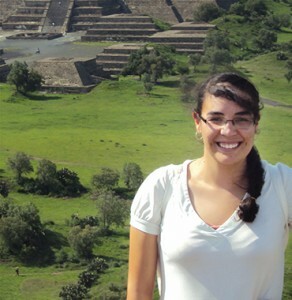 She currently works on the discourse analysis of the Mexican soap operas in her dissertation. She is also participating with the CIESAS Golfo research institute in a documentary and file research on the Totonac culture from the Tajin. She took part in the project as a translator and interpreter. 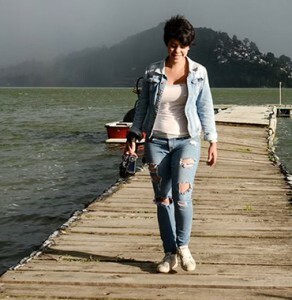 The Heart of Mexico has been a meaningful experience to her, where she was able to learn from her colleagues and the people from Valle de Bravo. Edith majored in Languages with emphasis in English translation at the Autonomous University of the State of Mexico. She has made translations and interpretations for her alma mater; she has given private English tutoring for undergraduates. She is interested in learning about different cultures, and believes that the best way to achieve this is by communicating with people. This is why she is broadening her knowledge of languages in French and German. Edith has participated in this project as a translator and interpreter. Her favorite hobby is reading. Cristhian is an undergraduate student from the Autonomous University of the State of Mexico with a major in English Translation. 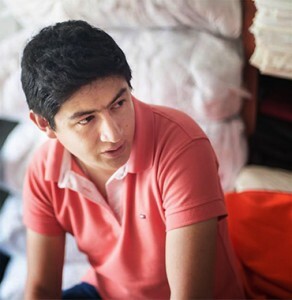 He is interested in learning English and Spanish languages. 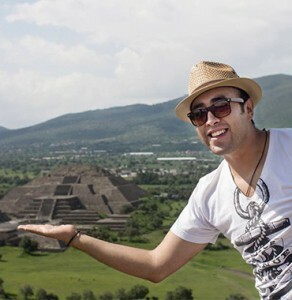 He collaborated with the Heart of Mexico 2014 as a translator and interpreter. The fact of collaborating and being part of the team was an extraordinary experience for him. While he was translating, he realized about the great need of helping people and the communication between cultures to break some barriers. He found the sense and the meaning of service and professionalism inside this project. Addi is an undergraduate student in Bachelor of Arts in Languages at the Autonomous University of the State of Mexico; his major is in English translation. As his dissertation, he works in a diachronic comparison in the dubbing in children movies. On the project The Heart of Mexico he works as a translator and interpreter. After he finishes this project, he will be graduated from college and his target is to study masters in translation or linguistics. Caitlyn Jones is an undergraduate student studying photojournalism, expecting to graduate from the University of North Texas in May of 2015. 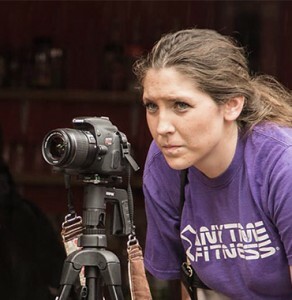 Caitlyn worked as a multimedia producer for Heart of Mexico 2014. Prior to that, she worked on “Father God, Mother Earth,” a story about the effect organic living can have on the human condition. She is currently the features editor for the North Texas Daily, a student-run newspaper at the University of North Texas, as well as a breaking news intern at The Dallas Morning News. Amanda Ogle is a graduate student at the University of North Texas. She will be receiving her Master’s of Journalism degree in May 2015. 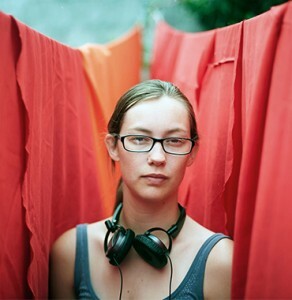 She focuses on narrative storytelling and photojournalism. 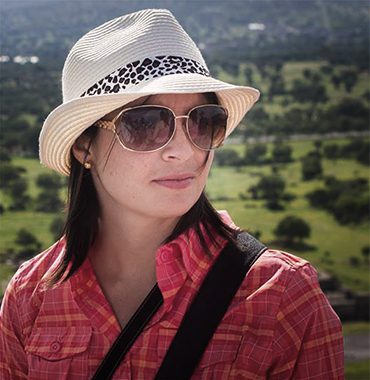 Amanda served as a multimedia producer for Heart of Mexico 2014. 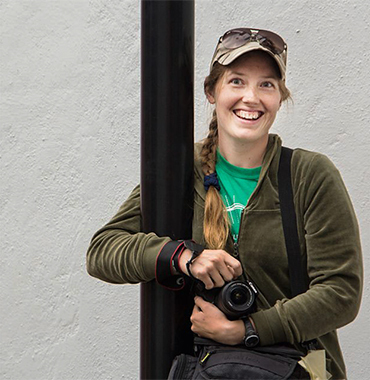 After graduation, she hopes to pursue a career in magazine production and to travel. Christina Gunlock will graduate with a B.A. in Journalism from the University of North Texas in December of 2014. 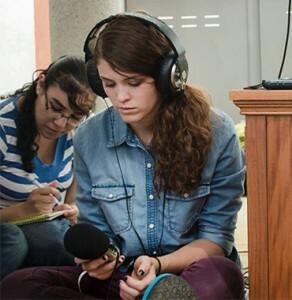 Christina served as a video producer for Heart of Mexico 2014. Her previous projects have also explored personal transformations. “Restoration,” chronicles one man’s renewal through his faith and his work restoring furniture. “The Horse Doctor,” reveals an equine veterinarian’s relationship to his clients through their horses. 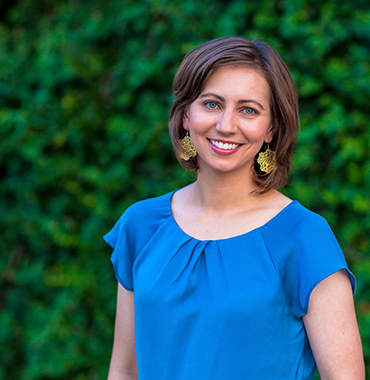 Christina is managing editor at Hatch Visuals, a student-run media agency in the UNT Mayborn School of Journalism. Hatch Visuals, a student-run visual media agency. Jun Ma, an international student from China, holds a Bachelor’s in Psychology and Photojournalism and is a non-degree-seeking graduate student at the University of North Texas. He served as a multimedia producer for The Heart of Mexico. His story for that project “Blood & Skin” won an award in the 2013 Hearst College Journalism Awards. A self-taught photographer, he is now focusing on video production. He worked as an official photographer for UNT and was a founding member and technology director for Hatch Visuals, a student-run visual media agency. Jeff Woo is a current undergraduate student majoring in photojournalism at the University of North Texas. He served as a video producer for Heart of Mexico. 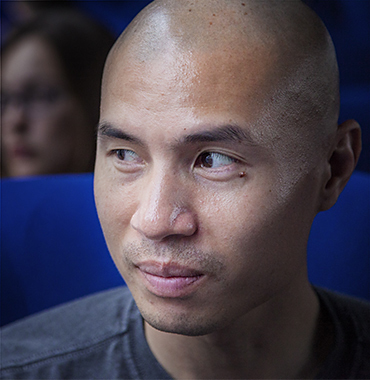 He has a passion for creating photo essays and documentary photography. Jeff is an alumnus of the Missouri Photojournalism Workshop. In the future, he would like to travel the world doing visual documentaries. Thorne Anderson, Project Director, joined the Mayborn School of Journalism at the University of North Texas as an Assistant Professor in fall 2009. He is a specialist in photojournalism, visual communication, and multimedia storytelling. 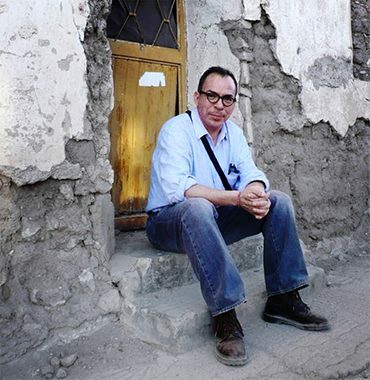 He has worked internationally as a freelance photojournalist for numerous publications including the New York Times, Los Angeles Times, Boston Globe, Chicago Tribune, and Time, Newsweek, U.S. News & World Report, and Stern magazines. He is a co-author/photographer of Unembedded: Four Independent Photojournalists on the War in Iraq. His work was recently shown in the exhibit “Eye Level in Iraq” at the M. H. de Young Museum of Art in San Francisco. He believes it is important for photographers to challenge themselves and their audiences, to immerse themselves in the lives of their subjects, to see beyond the obvious, to extract the extraordinary from the mundane, and to reveal the sacred in the profane. He will also play his guitar anywhere you let him. Lenin Martell, Project Director, teaches full time at the School of Political and Social Sciences in the University of the State of Mexico. He graduated in Mass Communication studies from Boston University. He has co-authored several academic books and essays on media and cultural studies. Martell has also worked as a bilingual education editor for several publishers in the United States. He currently writes for the “Zócalo” media magazine. He appears regularly as a media and public affairs commentator on radio and television throughout Latin America. Martell lives in Mexico City and races in open-water-swim marathons. Hugo Andrade is a professor in English in the Faculty of Languages in the Autonomous University of the State of Mexico. He began teaching English as a foreign language at 18, a career that has lasted for more than 23 years. He specializes in applied linguistics, especially reading comprehension, language proficiency, and language teaching and evaluation. 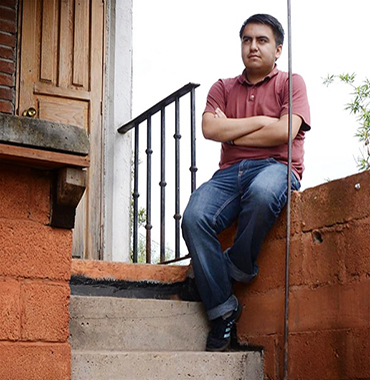 He is currently completing a Ph.D. in Linguistics at the Autonomous National University of Mexico. He participated in Heart of Mexico as faculty supervisor to the interpreters and translators. 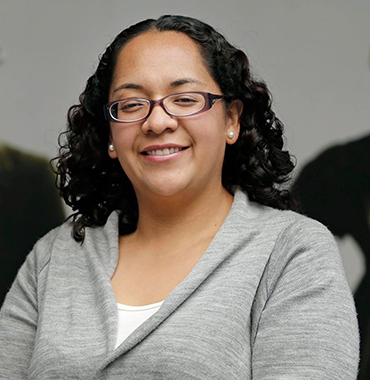 Andrade has experience in strategic planning worked in administration for eight years at UAEM before taking a position as a researcher and professor in the Faculty of Languages. He loves movies and American football, and is studying photography. David Tarrant started at The Dallas Morning News in 1984 as a suburban reporter. In 1986, he wrote a series on the hungry and homeless in Dallas that won the Heywood Broun award. Along with other staff members, he was also a finalist for the Pulitzer Prize for coverage of the crash of Delta 191. From 1988 to 1992, Tarrant worked at Stars & Stripes in Europe and covered the fall of the Berlin Wall and the Gulf War. He returned to The News in 1993 to write profiles, narratives and enterprise stories. In 2003, he wrote a four-part series chronicling the journey of four Dallas-area Marine recruits through boot camp, which won a Texas Associated Press Managing Editors award. He won another Texas APME in 2008 for a three-part series on the journey of a woman, whose Air Force pilot husband had been missing since the Vietnam War. He was nominated for the 2011 Pulitzer Prize for “Private Battles,” about military families struggling through 10 years of war. That series won the 2011 national DART award at Columbia University. A native of Pittsburgh, Pa., and a graduate of Holy Cross College, Dave lives in Arlington, Texas, with his wife, Sharon, their two children, Jackson and Natalie, and their dogs Sandy and Annie. Samantha Guzman received an M.A. in Journalism from UNT in May 2014. She is a visual journalist and writer who specializes in narrative storytelling. Sam was a founding member and managing editor for Hatch Visuals, a student-run visual media agency. 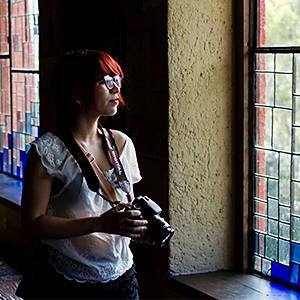 She served as project assistant and still photography instructor for the Heart of Mexico 2014 project. 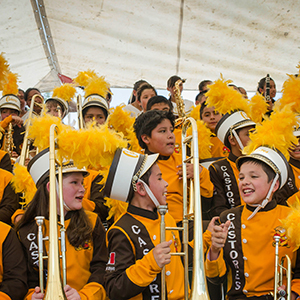 Sam’s work from Heart of Mexico 2013, “The Protection of Cristo Rey,” won multiple awards including 1st place in National Press Photographers Student Quarterly Multimedia Contest. Sam was also a producer for The Arrivals, a multimedia documentary project about immigrants in North Texas affected by DACA immigration policy. Alfredo Corchado Mexico is bureau chief for The Dallas Morning News and author of Midnight in Mexico: A Reporter’s Journey Through a Country’s Descent Into Darkness. He served as a professional mentor to the Heart of Mexico team. Corchado is a noted expert on immigration, drug violence, and foreign policy between the U.S. and Mexico. Over the years, Corchado has exposed government corruption and the reach of Mexican drug traffickers into U.S. communities. He has described the perils that journalists face and the disturbing result: an increasingly silent Mexican press. Born in Durango, Mexico, Corchado grew up in California and Texas. He worked as a farm worker alongside his parents, who were members of the United Farm Workers, the union led by Cesar Chavez. 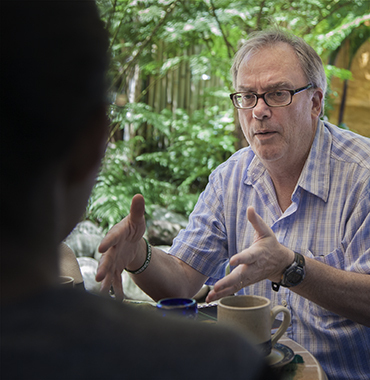 As a reporter for U.S. newspapers, including The Wall Street Journal, he has written about the plight of immigrants and their perilous journey to the United States. 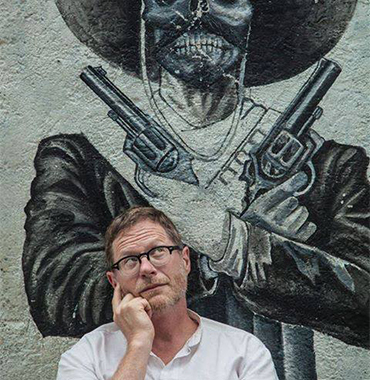 Corchado is a 1984 graduate of El Paso Community College, a 1987 graduate of the University of Texas at El Paso, and a supporter and frequent presenter at the Mayborn Literary Nonfiction Conference at the University of North Texas. He currently resides in Mexico City, but calls the border home. 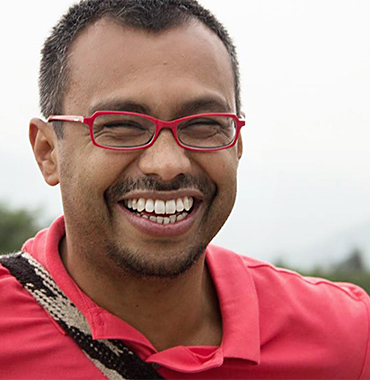 A 2009 Nieman Fellow at Harvard and a 2010 Rockefeller Fellow and Woodrow Wilson Scholar, Corchado won the Maria Moors Cabot award from Columbia Journalism School in 2007 for extraordinary bravery and enterprise. In 2010 he was awarded Colby College’s Elijah Parish Lovejoy Award for courageous journalism. Valle de Bravo, officially designated a “Magic Town” by the Mexican government, is a tourists’ haven on the shores of Lake Miguel Aleman. The lake flooded what was once the fertile agricultural center of the village.